Convective outlook is used by NOAA to provide the public and meteorologists information on the potential severity and probability of occurrence of a weather system within the United States. This includes a convective outlook for hurricanes, thunderstorms, tornadoes, high winds, hail, snow, etc. Want to know if a storm might be heading your way in the near future? 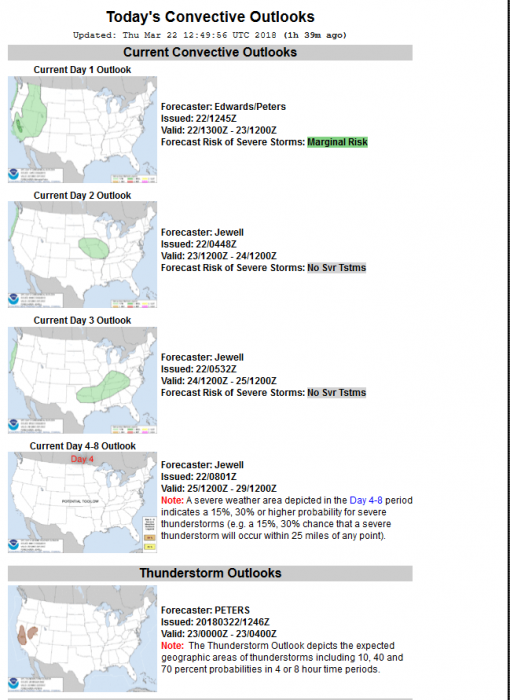 You can check your local weather forecast, but you can also check the National Oceanic Atmospheric Administration (NOAA)’s Storm Prediction Center and convective outlooks. The convective outlooks maintained by the NOAA can provide you with a little more information than your local weather reports, but you have to know how to read them. Let’s take a closer look at what the convective outlook is and how to interpret it. The NOAA’s Storm Prediction Center issues convective outlooks which cover probable weather patterns for the next six to 192 hours. It tracks the probability of severe weather events. Severe storms are driven by the process of convection, which creates clouds and rain, hence the name. Convection based weather events include squall lines, supercells, and multicell thunderstorms. The probabilistic forecasts which the Storm Prediction Center puts out fall into one of six different risk levels, reflecting the chance of severe and hazardous weather for a particular region of the United States. Note that the National Weather Service defines a severe thunderstorm as a storm with a tornado, and/or that has gusts of wind that hit at least 58 MPH, and/or occurrences of hail that are at least one inch in size. The first of the six different risks levels is Thunderstorms (TSTM) which is typically rendered as a light green line on the outlook and covers a general risk for thunderstorms over a particular geographic area. The second level is Marginal, abbreviated as MRGL, and this is a dark green shaded area that indicates that there is an existing yet low risk of severe weather events in an area. The third level of the risk chart is Slight (SLGT), which consists of a yellow shaded region and shows that there is the possibility of short-lived severe storms in a region, possibly bringing hail and damaging wind. The fourth level of the outlook is Enhanced (ENH) risk of severe storms. The Enhanced category is portrayed with the color orange on the outlook and storms at this level can be numerous. They can bring severe wind damage along with intense hail between 1 to 2 inches large. The fifth level of the severe storm outlook is Moderate (MDT), and it represents “long-lived, widespread and intense” storms. Storms in this category can bring hail over 2 inches in diameter as well as widespread damage from wind including strong tornadoes. The Moderate category is represented by the color red on the outlook. The final category of the severe thunderstorm outlook is High (HIGH), and is marked by the probable occurrence of extremely long-lived, intense and highly damaging storms. Outbreaks of multiple tornadoes and derecho (a straight line of intense storms pushed along at high speeds by fast winds), along with damaging large sized hail (2 inches plus) can occur at this level. The High threat category is marked by a bright pink on the convective outlook map. The levels of categorical risks are calculated using an algorithm which computes the probability of individual severe storms, damaging winds, tornadoes and damaging hail on the first day of the outlook, and the combined risk of severe weather events on the following days. The categories are based off off the probability that a severe weather phenomenon will occur within 25 miles of a particulate location. For the longer term severe weather outlook, between 4 to 8 days ahead, the NOAA issues outlooks based on a 15% or a 30% threshold. In other words, if there is greater than a 15% chance or a 30% chance of severe weather occurring in an area 4 to 8 days out from the current date, the outlook will reflect this chance on the map. If there is no 15% chance severe weather events found, the severe weather outlook for 4 to 8 days ahead will read either Predictability Too Low or Potential Too Low. Predictability Too Low means that while some models indicated there could be a potentially severe storm in the region, the occurrence or location of the storm is too in doubt to make a proper prediction. Potential Too Low is used when it’s unlikely that there are any 15% chance or higher severe weather events in the region that day. The convective outlook map can be displayed with the categorical convective outlook (which combines the probability of tornadoes, severe wind, and hail), or you can view the probability of either a tornado, severe wind, or hail individually. The convective outlook page also notifies you about any current watches or warnings in an area. Severe weather watches are distinct from severe weather warnings. 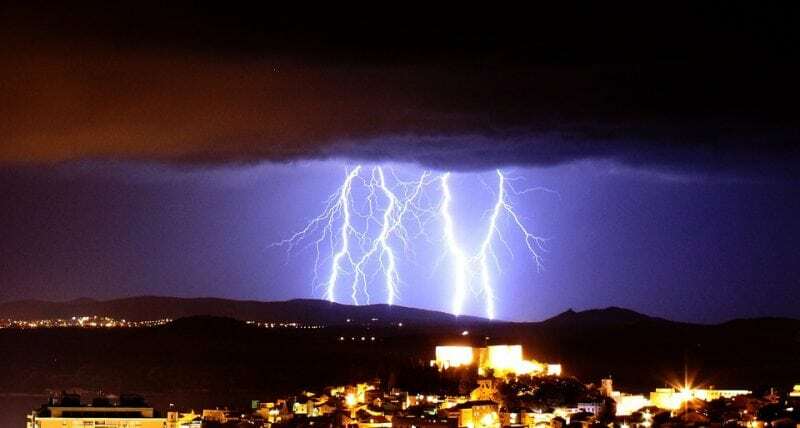 In the case of a Severe Thunderstorm or Tornado Watch, this means that conditions are favorable for severe thunderstorms or tornadoes to occur. It does not mean that a severe weather event will necessarily occur, but when a watch goes out people are encouraged to stay alert to any potential changes in the weather and the development of possible warnings. A warning for a severe thunderstorm or tornado means that the servere weather event has developed and been sighted within the area, so citizens living in the region should prepare and be cautious. Because lightning can often cause fires, the severe weather outlook also highlights regions of the country where weather conditions and fuel conditions combined means that fires are likely to occur over the next eight days. Much like the forecast for severe weather, the fire weather lookout is divided into five different categories. There’s Elevated risk, Critical Risk, Extreme Risk, elevated risk by dry thunderstorms (ISODRYT), and critical risk by dry thunderstorms (SCTDRYT). When viewing the various pages that show the convective outlook, the text below the convective map will contain some information on the forecast. There will be a summary of the convective outlook that highlights the regions of the country that are at risk for extreme weather events. The forecast discussion will also address the specific weather conditions that make the occurrence of a severe weather event likely, such as humid moist air moving across the plains of Georgia or strong winds moving across the Florida peninsula. While your local weather forecast is useful for near-term weather reports if you’d like to know more about the exact conditions creating the weather the convective weather outlook can be an excellent resource.